This year’s opening ceremony will take place at a venue with historical significance. The DOG president will welcome congress participants in the plenary hall of West Germany’s former parliamentary building. In the same seats where DOG participants will witness the honorary membership ceremony, the president’s address, and this year’s guest lecture, German members of parliament made policies and decisions that determined the nation’s fate up until the 1990s. 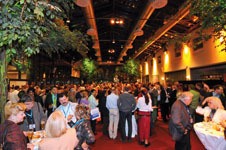 Following the opening ceremony, the traditional Get Together will take place at the foyer of the Plenarsaal.